• Flex-arm lets you view object comfortably. • Fluorescent lamp provides lots of light. • Clamps to almost any table. • Great for people with low vision. 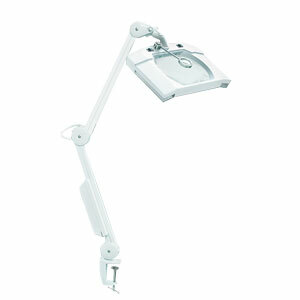 The Reizen Magnifying Lamp with flex-arm, clamp and your choice of 3 or 5 diopter glass lens. Lens measures 7.5" x 6.2". Includes standard table bracket mounting and a 9W energy saving fluorescent bulb. Great for reading small type or working on intricate projects! • Also Available: add-on 2x diopter lens or add-on 3x diopter lens - Purchase seprately.